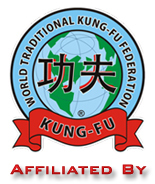 From its inception, the WKFI has been dedicated to encouraging the growth, development and promotion of a traditional and contemporary wushu-kungfu in India. 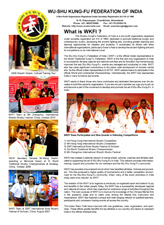 By coordination wushu-kungfu competitions and activities, and acting as a governing body for the sport in this country, the Federation seeks not only to make national progress in organizing wushu-kungfu but also to represent India and develop the sport on an international level.The Formation of WKFI has made tremendous improvements in how Wushu KungFu events and activities are managed and conducted in the nation. The Federation continues to grow and make significant progress every year. Two years after its formation, the Wushu KungFu Federation of India organized The 2001 National Wushu Kungfu Festival which stands as a testament to the dedication of that goal. With nearly 800 athletes and officials from around all the parts of the country, this was the first time the Festival was held in India, and it was the largest ever. The WKFI was proud to offer hospitality and friendship to the many athletes from around the country. The desirable athletes were felicitated with their respective awards. WKFI is the only organization in India which hosts the National Festival every year. The WKFI has brought its National Team to Russia, Nepal, China, Hong Kong and Singapore. In 2007, International Wushu Federation hosted it’s 3rd World Traditional Wushu Championaship in Shiyan, China. It was the world’s biggest traditional Wushu competition in which WKFI team successfully participated and got it’s name embedded in the history of India by achieving the memorial award.